My lunch today. So yummy and inspired by the whole “Ants On a Log” theme. I am not a big raisin fan, but this integration of them works well for me. The creamy peanut butter, the crunchy celery…I love it. This is also a great after-school snack, or maybe even one to pack in the kid’s lunches. I might try that. Eat up and feel like a kid again! I must have this now…drooling. This ranks right up there with my peanut butter, mayo and dill pickle version. What a fun idea. Me loves peanut butter! My dear friend’s Mother would make us PB+J with shredded iceburg. Unreal! Now I make them for my grown niece. My twist is sliced fruit instead of jellyalong with the lettuce and peanut or almond butter.I hope you try it! Ants on a Log Sandwich! So cute, I have never thought of doing this…going to try it in kids lunch box this wk. Thanks! Yes, that is a great combination! Nothing like peanut butter sandwich on very soft white bread! I could eat that everyday and not get tired of it! Made these for my kids and they loved them!! Bravo! You have tapped into your inner child! I, too, this week took a trip back when I made myself a grilled peanut butter and jelly sandwich. It was wonderful! Sounds OK to me but it is not exciting. 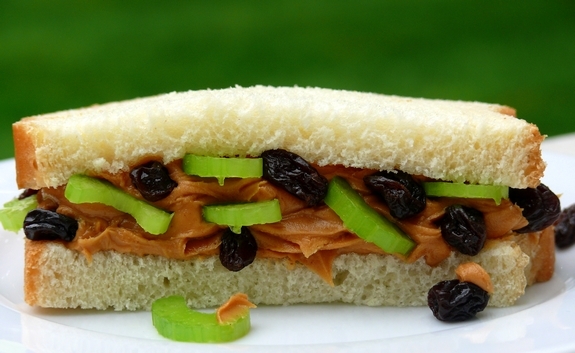 Hasn’t almost everyone had PB or Cream Cheese on a celery stick (raisins are a nice touch). I like the strange—I’m sticking with my PB&P (dill!!!) or my PB,mayo and lettuce. I have two sons in medical school and I can’t get them to even try.Think it’s gross, but they gladly eat raw fish, snails, oysters. One of my sons just got married…must get his wife hooked so that the PB&P that I created fifty-five years ago can be passed on to future generations. I LOVED ants on a log as a kid! Great concept. Adore your blog!